Charlie Blakeman has just published his first novel, to almost no acclaim. He's living on New York's Washington Square, struggling with his follow-up, and floundering within his pseudointellectual coterie when his college love, Sophie Wilder, returns to his life. Sophie is also struggling, though Charlie isn't sure why, since they've barely spoke, after falling out a decade before. Now Sophie begins to tell Charlie the story of her life since then, particularly the story of the days she spent taking care of a dying man with his own terrible past and of the difficult decision he forced her to make. When she disappears once again, Charlie sets out to discover what happened to Sophie Wilder. Christopher Beha's debut novel explores faith, love, friendship, and, ultimately, the redemptive power of storytelling. Christopher R. Beha is an associate editor at "Harper s Magazine" and the author of a memoir, "The Whole Five Feet." He contributes frequently to the "New York Times Book Review." 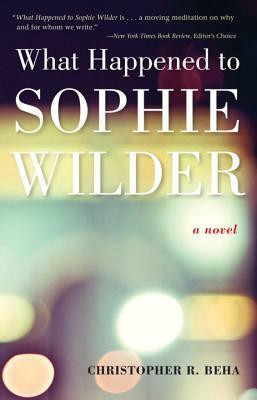 "What Happened to Sophie Wilder" is his first novel. Minneapolis Star Tribune names What Happened to Sophie Wilder one of the Top Ten Books of the Year. "Christopher Beha's What Happened to Sophie Wilder is a wonderful novelsmart, sly and lucid, a story about belief in all its forms that is wholly satisfying and quietly thrilling." book that is satisfying for anyone who reads in order to live." storytelling, a novel built sturdily of wisdom, beauty, and love.